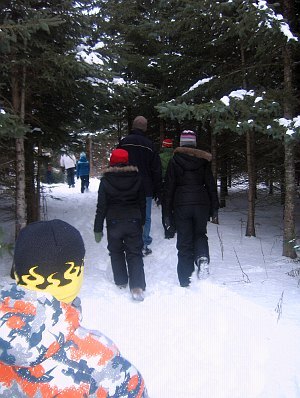 Yesterday we took to the woods with a few friends to hunt for our respective Christmas trees. Armed only with a hand saw we were hoping to hunt down three suitable trees. We entered the forest looking high and low, left and right, near and far. This was no ordinary hunting ground, missing were the ordered rows of Christmas trees planted in different years so to mature over the years to come. No, we were hunting in the wild, in the forest, where trees grow unchecked for year after year. It soon became evident that to take home the perfect tree some creative cutting might need to be done. Most of the trees were wild, large trees so they needed to be chopped down then chopped again, or cut fairly high up the trunk. Finally one of the families with us spotted their tree, the one that was to fit perfectly in their living room. Not long after the other family closed in on their own and half the hunting party started hauling their quarry back to the waiting vehicles. It was only us with out a tree. Joined in our search by our friends we retraced our steps revisiting possible trees only to reject them as too short, too thin, too uneven, too brown, too fat, or too ugly. We know we have made a name for ourselves but we have had some beautiful trees over the years and we could not see what we wanted. If you have visited our house at Christmas you would know that always have a tall tree. Our ceiling is at least ten foot high where we place our tree and more than once we have brought home a tree only to have to chop a little off the top. In the end we gave up our hunt. The wild tree was not for us, no we were going back to the pay station to buy one bred in captivity. These trees were baled already so we were taking a risk, but when it was set up in our lounge room we were satisfied that we had chosen well. It is a beautifully shaped tree, a little shorter than past years at about seven foot but lovely all the same. What made the hunt all the more enjoyable of course was the company of our friends and the beautiful day. 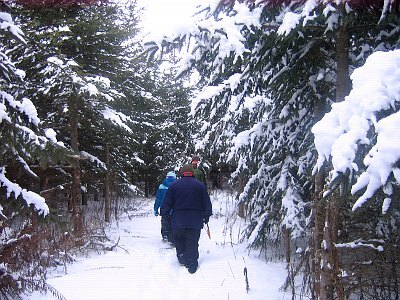 We had wondered whether we would be tramping through green woods on our hunt, but no, the trees were laden and there was 15-20 cm of fresh snow on the ground. This entry was posted in Friends on December 13, 2009 by Heather. RJ’s comment was “They are too fussy!”, to which I replied “Look who’s talking”. I am sure it was a fun day and the tree will look great. We look forward to seeing more photos when it is installed and decorated.